Consumers today research content and information in vastly different ways than just a few years ago. Over half of the searches made worldwide on Google each month happen on mobile devices. With the accessibility of Smart Phones, the mobile revolution is no longer just impacting western economies. With this global shift in how people connect and research for solutions online, business owners need to place a greater emphasis on their website's mobile experience in order to deliver their message in the most impactful way. On April 21, 2015, Google released a significant new mobile-friendly ranking algorithm. The purpose of the update was to give a boost to mobile-friendly pages in Google’s mobile search results. The update became known as “mobilegeddon.” While many site owners have implemented a mobile website or have adopted responsive design, most mobile experiences leave much to be desired. As Google puts more and more of a focus on user experience, and more specifically mobile user experience, website owners need to pay attention. The goal behind this initiative is to create a better, faster and more friendly mobile web experience for users. The push for a faster mobile web is two-fold. The main focus of this project is speed. Why, because today the average attention span has shrunk to 8.25 seconds - that's shorter than that of a goldfish. The second focus is about helping businesses, website owners and content publishers better engage their users, which in return will help their marketing and could lead to more revenue. In order to create a smarter, faster and more user friendly mobile web experience, Google, along with a number of publishers and technology companies have come together to make mobile work better for the world. Some of the early adopters have been Twitter, Pinterest, WordPress.com, Chartbeat, Parse.ly, Adobe Analytics and LinkedIn. The 3 key areas accelerated mobile pages will focus on are content, distribution and ads. Having a mobile website is no longer enough. If you still haven’t gone mobile, now is the time to take action. [Get a Free Mobile Website Assessment Here] Research done by BuzzBoard found that 47.3 percent of small businesses do not have mobile-ready sites. Mobile is the primary way consumers are searching for information online. Those with mobile websites have the potential to double the audience of those without mobile sites. According to comScore’s “Global Mobile Report,” virtually half of all traffic to the top 100 digital media properties are mobile only. The problem with not embracing mobile is two-sided. First, consumers are demanding it. Second, as we read at the top and have seen with the “Mobile Friendly Update,” Google is tweaking their algorithm to favor mobile sites. 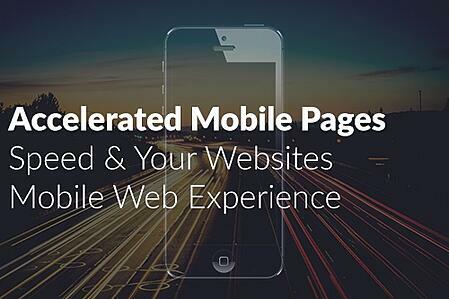 If you want to be relevant to your audience and increase the amount of targeted web traffic to your site, a fast, user-focused mobile experience is a must! Google is constantly updating and tweaking their algorithm to deliver the most relevant results. So how can your business stay in front of the competition and create an advantage? Search Engine Land created a guide with 7 observations on the impact of speed in relation to mobile search. Below is a quick overview, but to get all the details check out their full article here. Consumers want more than just mobile websites, they want fast mobile websites. If your website is slow, you lose. Google itself has come out this year stating that Google favors faster sites. When Google makes a statement like this, website owners need to pay attention and put into action what they express. Google is competing to keep users on the mobile web when they are increasingly spending time on apps. Apps are now addressing poor speed on mobile, like Facebook’s Instant Articles. This is one of the main driving points behind Accelerated Mobile Pages. According to a 2013 Harris Interactive survey, 33 percent of users who had a negative mobile shopping experience head to a competitor’s site. But what’s even more important is that 30 percent will never return to the offending website. First impressions matter. The weight or size of your website's pages are a key factor in page load times. Minimize the number and size of files that must be downloaded when your page is loaded. Using a caching plugin or a CDN to gzip your files can increase speed. Images and videos are heavy. Use compression tools and other size-reducing utilities to lighten the amount of data that must be loaded. For Wordpress sites, WP Smush is a great plugin. Optimize your font for page load. Some fonts can be surprisingly large, and being smart about your selection and strategy for how they are used can improve speed. Optimize the timing of when certain items on your page load. For example, content below the fold that isn’t viewable until the user scrolls down the screen can be delayed to load after content above the fold. Also, preloading can be timed so that content is loaded during inactive breaks before the user gets there.